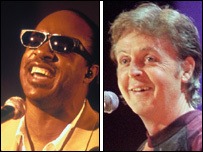 Paul McCartney and Stevie Wonder's paean to racial harmony, Ebony and Ivory, has been named the worst duet in history by listeners to BBC 6 Music. The song, which reached number one in 1982, topped a list which also included McCartney's schmaltzy duet with Michael Jackson, The Girl Is Mine, at six. Sinead O'Connor and The Chieftains were the surprise winners of the best collaboration vote, with Foggy Dew. David Bowie and Mick Jagger's cover of Dancing In The Street made both lists. Results of the poll, named Come Together, were revealed by DJ Phil Jupitus in a top 40 countdown on Saturday. He revealed that Fairytale of New York, by the Pogues and Kirsty MacColl, would have been number one had it not been for a campaign by fans of the Chieftains song. "The voting was closing on Sunday," he explained. "Between Friday and the vote closing, all of the votes came in for the number one record. "I congratulate the fans who were organised enough to ruin our vote." The result meant that Fairytale of New York came second, with Queen and David Bowie's Under Pressure third. The top five was rounded out by Nick Cave and Kylie Minogue's murder ballad Where The Wild Roses Grow and Walk This Way by Run DMC and Aerosmith. A Comic Relief version of Walk This Way - featuring girl bands Sugababes and Girls Aloud - took joint tenth place in the worst collaboration list with Band Aid's Do They Know It's Christmas. Also on the list of disastrous duets were Arthur Mullard and Hilda Baker's comedy remake of You're the One that I Want, which came second. David Bowie was in third and fourth place - with Dancing In The Street and Little Drummer Boy, his collaborations with Mick Jagger and Bing Crosby, respectively. Fifth place went to Rene and Renata's number one ballad Save Your Love.